We’d love your help. Let us know what’s wrong with this preview of The Faber Book of Exploration by Benedict Allen. What does it feel like to walk off the edge of a map? To emerge dazed, dying yet triumphant, from the Amazon? Benedict Allen's anthology of human exploration ranges across various terrains - hot and cold deserts, mountains and plains, jungles and high seas - and presents the words of those who, through the centuries - be they Vikings or missionaries, conquistadors or botan What does it feel like to walk off the edge of a map? To emerge dazed, dying yet triumphant, from the Amazon? Benedict Allen's anthology of human exploration ranges across various terrains - hot and cold deserts, mountains and plains, jungles and high seas - and presents the words of those who, through the centuries - be they Vikings or missionaries, conquistadors or botanists - have set off into 'the unknown'. 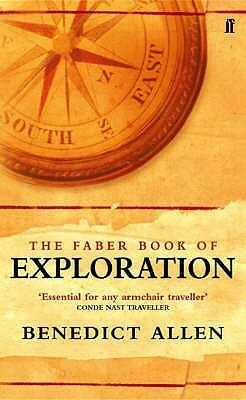 To ask other readers questions about The Faber Book of Exploration, please sign up. This a fantastic collection of hugely varied writing about travel. From the famous names of the great age of exploration, through to lesser known, but equally interesting tales of daring and challenge. It covers over 1500 years of travellers tales, which alone makes this a very unusual book. I recommend this to anyone interested in travel or travel writing, as I do not think there is another book quite like it. The standard of the writing is variable, but all is interesting. The one drawback is This a fantastic collection of hugely varied writing about travel. From the famous names of the great age of exploration, through to lesser known, but equally interesting tales of daring and challenge. It covers over 1500 years of travellers tales, which alone makes this a very unusual book. I recommend this to anyone interested in travel or travel writing, as I do not think there is another book quite like it. The standard of the writing is variable, but all is interesting. The one drawback is that given the encyclopaedic coverage of dozens and dozens of writers, the amount from each writer can be very short. But then I think this is best considered as a taster to encourage you to go and read more about the ones you find most interesting! This book gets five stars because the hardcover version just looks so impressive on the shelves. Inside are four star excerpts from records (or recollections) of exploration throughout the ages. A nice selection. True tales from the golden age of exploration. How can one top that? I don't care much for the glamorized photo of the editor on the back cover flap but I'll let that pass. It's the kind of book I read again and again, like the Mammoth Book of Endurance. After reading the journals of the great explorers I resolved never to be whiny in my writings, or complain about the leeches, discomfort, smell, or other small inconveniences. At times illuminating and at times frustrating, but that's what you get with short excerpts from a collection of the best exploration writing over a long time period. You can dip in and out, or follow your interests, but the main attraction of this book for me was allowing me to follow up with the full texts in the future. I'm docking this book some points because of the tiny print. I ended up having to use a magnifying glass. To readers thinking about reading this compilation, I would recommend getting the ebook version so you can increase the font size. One of my fave people on this planet - His books are a must for a good collection. Warning, his books may inspire to travel and spread wings.